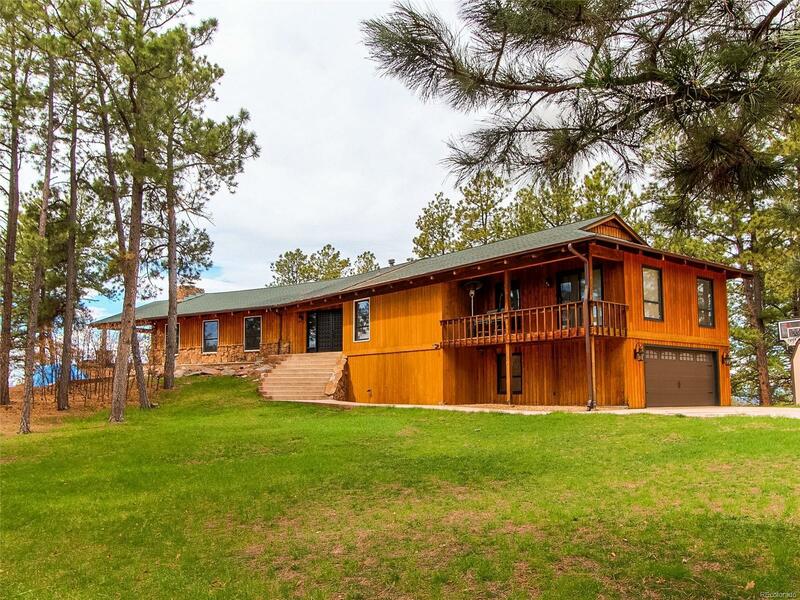 Enter the gates of this private community to find grassy meadows & towering pines as you drive up to this exquisite hilltop property w/unobstructed views from Pikes Peak to Longs Peak to Mt Evans and downtown Denver, over nothing but treetops! This home was the original farmhouse to this gated community and sits high on the hill secluded from other homes ranging in price from $750K to over 5,000,000. Drive down the paved driveway to find stamped concrete patios,wrap around porch leading to 2covered patios w/rare mountain views never seen this close to the city.3/4 of this home have been remodeled!Beautiful great rm with soaring ceilings, 8' Cabana doors that bring the outside in! New laminate wood flooring,in-floor Radiant heat,New Cabinets,Granite Countertops & top of the line GE Cafe Appliances to include a 5 Burner gas cooktop/range/oven,additional built-in convection oven,space saver built-in microwave,LG Built-in refrigerator. Privacy,Serenity,Soaring Pines & Unobstructed Views!